The increasingly influential grouping said that all member-states equally determine the nature and character of G20 and that no individual state could ban the Russian president from attending the next summit. In what can be termed as the strongest support yet for Vladimir Putin, the BRICS backed the participation of the Russian President at the G20 summit in Australia this year, with a strong joint statement from the grouping’s ministers. “The ministers noted with concern the recent media statement on the forthcoming G20 summit to be held in Brisbane in November 2014. The custodianship of the G20 belongs to all member-states equally and no one member-state can unilaterally determine its nature and character,” the BRICS said in the statement read out by South African Foreign Minister Maite Nkoana-Mashabane. The meeting, attended by Nkoana-Mashabane, Russian Foreign Minister Sergey Lavrov, Indian External Affairs Minister Salaman Khurshid, Chinese Foreign Minister Wang Yi and Ambassador Carlos Antonio Paranhos, Under-Secretary General for Political Affairs of Brazil, was held on the sidelines of the Nuclear Security Summit in The Hague. The statement came after indications that Australia, the host may bar the Russian president from attending. Australian foreign minister Julie Bishop had hinted that Putin could be banned from attending the Brisbane summit in the wake of the reunification of Crimea with Russia. 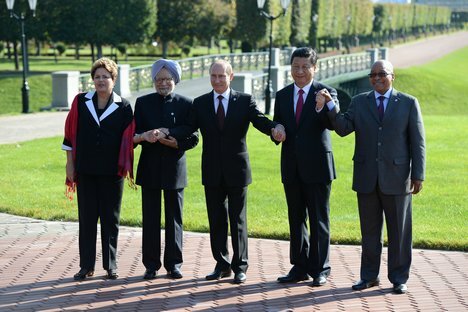 “We are still deciding on further steps that we will take in relation to the G20,” she said this week. “As far as a meeting of the BRICS foreign ministers is concerned, we have heard the understanding of the current situation and of historic aspects of the whole situation here in The Hague, and we are thankful to our partners for this,” Lavrov told a news conference. “The common position was stated: we altogether not just Australia formed the G20 and we will work in this mechanism just as we have once concluded,” Lavrov added.